Haverhill Beef Co. took home the first prize ribbon for their “Chillin’ and Grillin” window display. Creative Haverhill and the Greater Haverhill Chamber of Commerce were thrilled with the enthusiasm from Riverfront Cultural District and other Downtown Haverhill business owners in the first annual holiday window display competition this December. The goal of the competition was to initiate friendly competition between the businesses and give them an opportunity to showcase their creativity. Subsequently, the extra efforts made by participating businesses to light up and decorate their windows served to enhance the charm of the downtown this holiday season. Over twenty-five Downtown businesses participated in the window display competition, and the top five were chosen by the public on December 6, at the Greater Haverhill Chamber of Commerce’s ChillFest event. ChillFest-goers were asked to walk around and view the windows, then vote for their favorite at a display in Haverhill Bank’s Merrimack Street location. Each voter was entered into a free raffle for the chance to win a small prize. 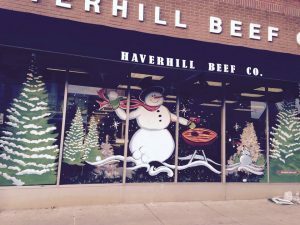 Haverhill Beef Co. took home the first prize ribbon for their “Chillin’ and Grillin;” window display, which featured a snowman grilling up some meat in a wintery landscape. The window was painted by local artist Jeffrey Morgan. Second place went to Dr. Richard Jasiak, Optometrist for his “Snowmen on Vacation”, another painted window done by local artist Rob Sardella. His snowmen could be seen hitting the slopes on their snowboards. The third place window from Studio @ 13 was also painted by Rob Sardella, and featured a piercing set of eyes, with red, green, and gold makeup, and two hands showing off a gorgeous holiday manicure. In fourth place was “In a Blue Moon Antiques”, showcasing some of their merchandise in a quaint winter scene. Finally, following closely behind in fifth place was “The Inside View” on Granite Street with a stunning display reminiscent of a cozy, decked out living room on Christmas day. Arndt and her team are already exploring ideas for next year’s competition, which will likely include category winners, open voting throughout the entire month of December, and prizes for “People’s Choice” and “Experts Choice”. Creative Haverhill hopes to make more artist-business pairings from its “Haverhill Artist Connection” group, which meets on the third Thursday of each month. Creative Haverhill aims to unite and promote local artists and creative businesses through educational programming and services, and to partner with other organizations to establish Haverhill as a destination for arts and culture. For more information about Creative Haverhill and the Riverfront Cultural District, please visit www.CreativeHaverhill.org .